IPS officer Violet Baruah has emerged as the first woman DIG of Assam Police. IPS officer Baruah, who is serving as the Commandant, 9th APBn, Barhampur, has been promoted to the grade of Super Time Scale-I of IPS in level 13A of pay matrix. 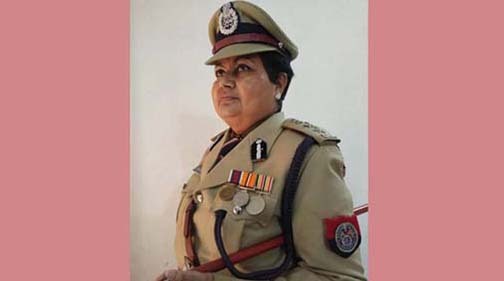 She has been transferred and posted as the Deputy Inspector General of Police (SB), Assam in Guwahati. Baruah will replace IPS officer Dilip Kumar Dey, who is serving as Deputy Inspector General of Police (SB), Assam, Guwahati. Dey has been transferred and posted as Deputy Inspector General of Police (CR), Diphu and he will replace IPS officer Prasanta Bhuyan. It may be mentioned that ahead of the Lok Sabha elections 2019, the Assam government has effected a minor reshuffle in the Police department in the IPS level. A per a notification issued by Dr Deepak Majumdar, secretary to Home (A) department, Assam, on Friday, Prasanta Rhuyan, IPS, who is serving as the Deputy Inspector General of Police (CR), Diphu, has been transferred and posted as the Deputy Inspector General of Police (NER), Tinsukia, against the existing vacancy. In partial modification of earlier government notification (No HMA 922/2015/107-D issued on January 11, 2019 and in the interest of public service, Luish Aind, IPS, who is serving as Deputy Commissioner of Police (Crime), Police Commissionerate, Guwahati, has been promoted to the grade of Super Time Scale-I of IPS in level 13A of pay matrix. He has been transferred and posted as Deputy Inspector General of Police (Security), Assam. On the other hand, IPS officer Arabinda Kalita, who is serving as Assistant Inspector General of Police (Admin), Assam in Guwahati, has been promoted to the grade of Super Time Scale-I of IPS in level 13A of pay matrix. He has been transferred and posted as Deputy Inspector General of Police (L&O), Assam against existing vacancy.